Gen. Yevgraf Zhivago: "I told myself it was beneath my dignity to arrest a man for pilfering firewood. But nothing ordered by the party is beneath the dignity of any man, and the party was right: One man desperate for a bit of fuel is pathetic. Five million people desperate for fuel will destroy a city. That was the first time I ever saw my brother. But I knew him. And I knew that I would disobey the party." Not as brilliant as I'd hoped. It may not be the best of David Lean's epics, but Dr. Zhivago is still brilliantly photographed and sweepingly romantic. 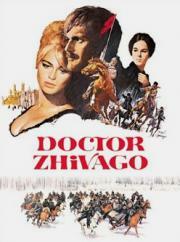 Zhivago is a magnificent Hollywood epic. The admiration I have for such productions and their sheer volume and vast number of people involved and orchestrated in the telling of compelling stories never fails to kick in. Zhivago possesses several memorable scene, a great cast and inspired performances - Sharif and Christie notably - as well as a wonderful score. All the factors add in to ease what would otherwise be an unbearable run time. Oh, and Klaus Kinski is crazy and enigmatic as usual. Gives the term "overacting" a new meaning. I don't mind that particular acting style, I do however mind cheap storytelling and empty clichés. Meaning Leans directing style. The lame on-the-nose dialogue makes the performances feel all the more awkward, almost turning it into a B-movie. I think it ultimately suffers from trying to stuff too much of an epic novel's plot into a movie, rendering every supposedly emotional moment and all the back-and-forth boring and borderline ridiculous. David Lean tackles Pasternak's sweeping epic admirably, relaying its tragic romance with enough energy and style to be sufficiently engaging over the three hour runtime. Fine photography and terrific production values bestow it a wonderful visual quality, and there are strong performances from Sharif, Courtenay and the immense Rod Steiger.